Well, February 21 was actually an A-okay day (as of 1:00 pm GMT+2). However, two full losses from the later half of February 20 meant that both variants took additional hits. By the way, if you’re a first-time reader and have no idea what this is all about, then you may wanna click on the links below to read about and understand the rules of the system. And if you want to know more about the details of the previous trades, you can do that by clicking on the relevant links below. Note: Trades # 64, 65, 67, and 68 are all still open as of 1:00 pm GMT. The trailing rules for trades # 64, 65, and 67 are already active. As for trade #68, it was just recently triggered and the rules to move SL to RSL haven’t even kicked in yet. The Fixed TP Variant registered three full wins, three full losses, and one open trade since last we saw it. 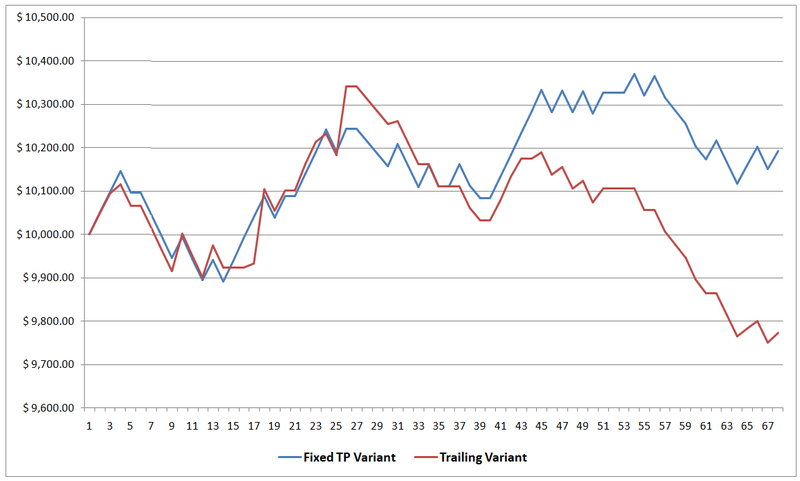 Instead of holding onto its gains, however, the Fixed TP Variant now only has +1.93% in gains (+2.17% previous). This is due to the relatively large 12-pip spread, which messes up our reward-to-risk ratio. Ideally, the reward-to-risk ratio should be at least 1:1. 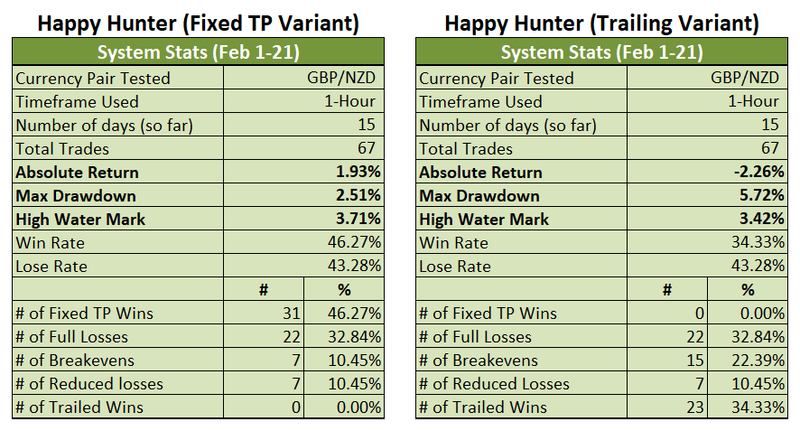 However, the large spread means that the Fixed TP Variant’s reward-to-risk ratio is around 0.95:1. The Trailing Variant had it worst since it’s now down by 2.26% for the month (-1.35% previous). Moreover, the Trailing Variant’s drawdown deepened from -4.61% to -5.72%. However, that could still change since trades # 64, 65, 67, and 68 are still actually open and the trailing rules are already active on trades # 64, 65, and 67. Anyhow, volatility appears to be finally picking up after over week. 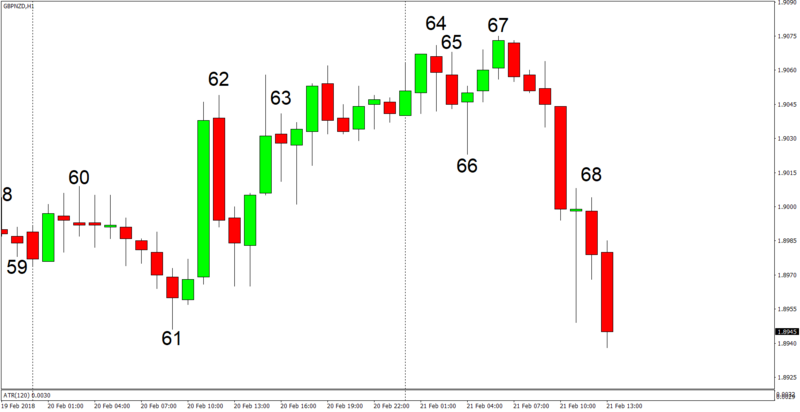 GBP/NZD is still range-bound if you also consider last week’s price action, though. Hopefully, we’ll see a breakout soon so that the Trailing Variant can finally recover. After all, it’s a trading maxim that periods of consolidation are usually followed by periods of explosive price action. Okay, that’s all I’ve got for now. And as always, I enjoy your feedback, so if you have any questions, or if you found an error somewhere, or if you just want to say “hi”, then don’t be shy and write a comment down below!